The use of electronic cigarettes among young people is becoming an important public health issue. How can pediatric nurses help prevent this dangerous practice? Learn more about the symptoms of adolescent depression and recommended treatment strategies. Children's playtime is an important component of physical and social skill development. What role can it play in healthcare settings? How useful is the Canadian Acute Respiratory Illness and Flu Scale (CARIFS) to pediatric clinicians in practice? A patient navigation program may help improve the transition of care from hospital to home for medically complex pediatric patients. 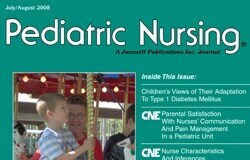 Mission Statement: Pediatric Nursing is a clinically based journal focusing on the needs of professional nurses in pediatric practice, research, administration, and education.